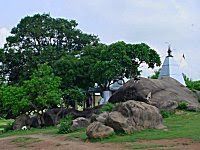 There is a small hillock in the east of Deoghar which is popularly known as Hathipahar or Mahadevatari. The name of Mahadevatari defines that this hillock is beneath the temple of Shiva. From a distance this hillock looks like an elephant, that is why, it is called Hathipahar. There is a small stream of water which flows continuously. People visit this place and drink the river water. The belief is that its water can cure all stomach related diseases.